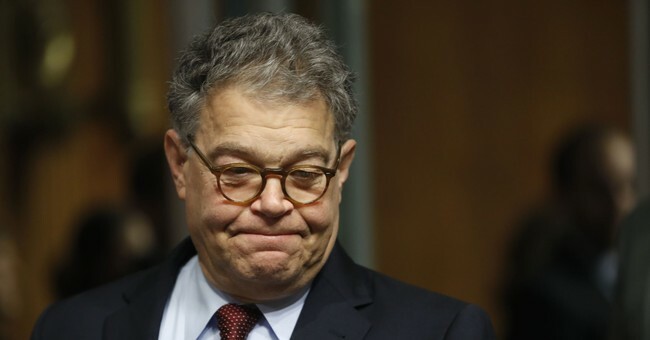 After his first attempt at an apology for groping a woman's breasts while she was asleep was ripped apart by just about everyone, Sen. Al Franken (D-MN) has issued a lengthier statement apologizing for his actions. Franken also called for an ethics investigation into his conduct and pledged to "gladly cooperate" with any investigation. “Coming from the world of comedy, I’ve told and written a lot of jokes that I once thought were funny but later came to realize were just plain offensive. But the intentions behind my actions aren’t the point at all. It’s the impact these jokes and on others that matters. And I’m sorry it’s taken me so long to come to terms with that. I mean, this is certainly a little more heartfelt than "As to the photo [Of Al Franken grabbing the breasts of a sleeping woman with a big grin on his face], it was intended to be funny but wasn't," this is still questionable. It's also quite strange that Franken would say in one paragraph that women "deserve to be heard, and believed" yet also dispute Tweeden's story of Franken forcing his tongue into her mouth by saying "I don't remember the rehearsal for the skit as Leeann does." Tweeden is a woman, and according to Franken, women deserve to be both heard and believed. Which is it? Additionally, what on earth is an ethics investigation going to prove if Franken admits that he groped Tweeden while she was asleep? The investigation is basically laid out in the statement.